The universities signed a MoU for cooperation in various fields. 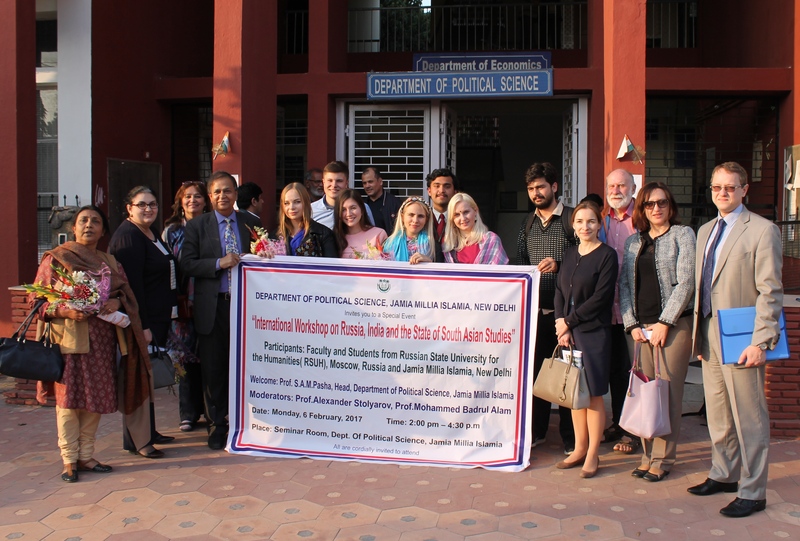 The Russian State University for the Humanities (RSUH) and Jamia Millia Islamia (JMI) University, on Feb. 8, held a seminar dedicated to the 70th anniversary of the establishment of diplomatic relations between Russia and India. Students from RSUH presented reports on various aspects of India-Russia relations from the history of diplomatic relations and India's motives for joining the Shanghai Cooperation Organization to cultural and military cooperation. “Our relations don't need glorification, but we need to remember the past and go to the future,” Rumki Basu, professor at JMI, said. RSUH and JMI also signed a memorandum of cooperation. The agreement aims at promoting scientific and educational programs, organizing conferences, and the exchanging of information and publications. Professor Mohammed Badrul Alam from JMI’s political studies department, who was one of organisers of the workshop, will be a visiting fellow at RSUH’s BRICS study room. During their India tour, the RSUH students visited Agra and a few cities in Rajasthan. They also attended a poetry reading held at Delhi University’s Department of Slavonic and Finno-Ugrian Studies.